Some films seem so straight forward that as you watch you begin to wonder what the point is. As the plot progresses you think you sense what’s coming and how it will end, which of course brings about the mental question, “why am I watching this?” There are plenty of films like that out there-the latest Ghostbusters and The Interview are the first to come to mind- and each time I hold out hope until the very end for a plot twist of some sort, only to be disappointed. But it’s films that seem to start down this path, only to throw in a twist that no one could’ve seen coming, that delight and bring me joy. Films that say, “You only think you know where I’m headed, but boy do I have a surprise for you!” The Grand Budapest Hotel, Remember and Kingsman: The Secret Service are all fine examples of what I’m talking about. 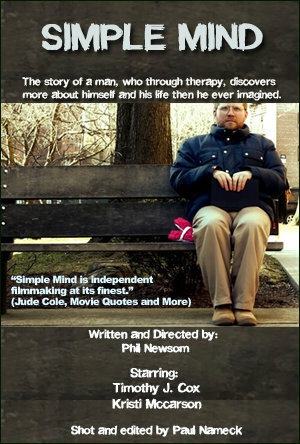 And so is Simple Mind, the directorial and writing debut of filmmaker Phil Newsom. The film’s summary goes something like this, “As Bob discusses life and recent occurrences with his therapist, he learns more about himself than he’d ever imagined.” Sounds interesting, right? What if I told you the entire twisting, turning plot only takes about ten minutes; then would you be interested? Although I thought I knew where the film was headed, it was nevertheless gripping throughout. Each new sentence out of Bob’s mouth and each new description of events as they unfolded had my eyes glued to the screen and my ears blocking out all outside noise they could. Actor Timothy J. Cox played the character of Bob so well that it’s easy to believe the surprise on his face at the end of the film is genuine, and not just a superb acting job. Simple Mind is one of those riveting little films that don’t come along very often. It’s one that will have you gasping in shock and replaying the events in your mind, trying to figure it all out as the end credits roll. Timothy J. Cox and filmmaker Phil Newsom deserve both appreciation and admiration for what they achieved with this film, and after watching it I think you’ll agree.